This historic book may have numerous typos and missing text. Purchasers can download a free scanned copy of the original book (without typos) from the publisher. Not indexed. Not illustrated. 1897 Excerpt: ...than the solid masonry structures previously erected. All matters pertaining to steel construction, properly belong to constructive engineering and will be there treated. 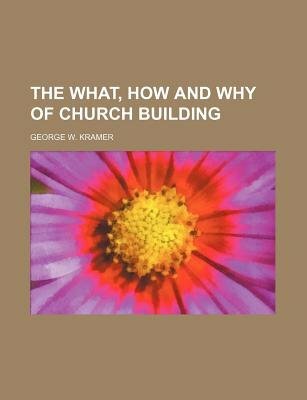 The interior finish of a building, especially a church, is of much less importance than the constructive portion, yet the impressions are largely influenced by its character and the care exercised in minor details. Hardwood is mostly used, should be select, clear and thoroughly seasoned. Doors form an important part of the finish, and often give more trouble than any other. All hardwood doors should be veneered on a pine centre or core, which in the best work should be laminated. In the Combination Church, the two auditoriums are connected by means of movable doors of some character, either to operate laterally, vertically, fold on each other or roll on a cylinder, --or large heavy curtains may be used. Owing to the great size of the doors--in some instances the opening having been made thirty feet high by sixty feet in width without any intervening columns, --the doors become quite heavy and should operate on special floor tracks and on specially constructed anti-friction sheaves: when properly equipped doors which may weigh nearly a ton each can be very readily and easily moved. Secure foundations must be provided with means for adjusting the track and overhead guides until the building has thoroughly settled, the heavier and larger doors should all operate laterally in pockets. Flexible doors may be secured for moderate sized openings which will wind on a roller, either operating laterally or vertically also a door folding on itself similar to inside window blinds--hung overhead. Guillotine doors or doors elevating by any means and balanced by weights should never be used, no cables or co.